March and April are a lot busier than you would imagine, with Mother’s Day, the Easter Bank Holiday and Grand National Weekend all acting as brilliant excuses to treat yourself and your loved ones to a special day. Alma De Cuba has a great range of events planned over the course of the next two months, with exquisite menus and live entertainment, you’ll be spoilt for choice! 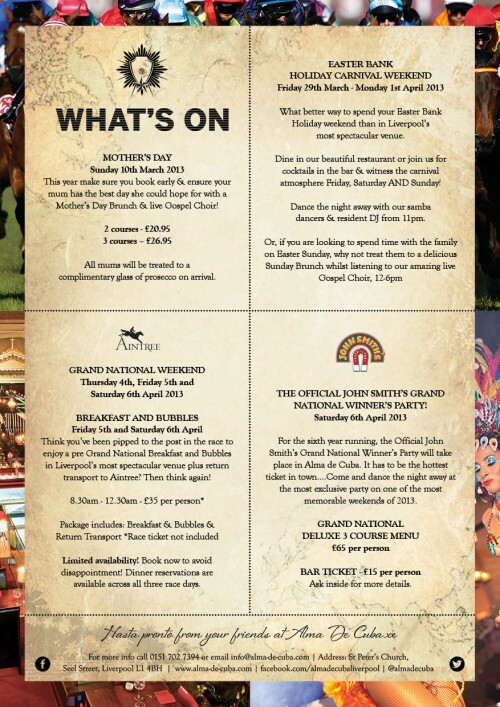 On Mother’s Day, you’ll be treated to a live gospel choir and a gorgeous menu and on Easter Bank Holiday weekend, the carnival will be in full swing with the help of Alma’s resident samba dancers and DJ. igoo created the promotional artwork as part of their ongoing maintenance work with Alma De Cuba.